Financial blogs, including MarketWatch, are taking serious an early claim by a Rosenblatt Securities analyst who says he's discovered that preorders of Apple's new iPhone XS and XS Max were "weaker compared to iPhone X preorders" a year ago. Reports have failed to note, however, that analyst Jun Zhang was wrong last year, too. After a year of remarkably terrible iPhone analysis, you might imagine that the financial press might look at analyst claims with a slight hint of skepticism. Over the past year, iPhone X launched as Apple's best selling smartphone and then remained its most popular model every quarter since-- despite its hefty $999 entry price, and stiff competition from Apple's other very good, less expensive iPhone models. Despite this reality, the tech media and their financial press counterparts stridently maintained that iPhone X was a "disappointing" product, reported that it was selling poorly, and maintained that it was inherently not capable of attracting broad interest because of its price-- and perhaps even because it wasn't "innovative." This notion was repeated over and over by financial blogs, tech blogs and even ostensibly legitimate newspapers including the Wall Street Journal, Japan's Nikkei and Bloomberg. Right out of the starting gate, a new narrative cycle of iPhone failure is beginning, based on a simpleton data source so laughable that it makes channel checks sound almost legitimate in comparison. Rosenblatt's analyst is basing his idea of weaker new iPhone XS demand "on his analysis of iPhone wait times," noted Emily Bary for Marketwatch. To anyone who has ever watched Apple's estimated wait times for preorders, this is insane. Apple doesn't present an accurate-to-the-day estimate for shipping. It presents a large window period, generally of multiple weeks. Apple's production ramp involves the building of tens of millions of devices per week, and its estimates change wildly as it adjusts production and shipping estimates for placed orders. You might be told your phone is slated to ship in a couple weeks, then see it shipped and en route the next day. There is no reliable data to pull from shipping estimates. They are a ballpark provided to manage the expectations of consumers. Bary's piece actually did note that the other analyst she got a quote from (Jeffrey Kvaal of Instinet) disputed the idea that demand was any weaker this year than last. However, Marketwatch used the more sensational Rosenblatt-Zhang prediction as its headline, and pluralized his idea to sound like it came from multiple analysts, rather than being so controversial that its writer couldn't even find two people to quote in agreement of this analysis. Kvaal actually told Marketwatch that Apple "doesn't appear to be planning for 'slim availability' of any of the three phones it introduced last week," making it even more impossible to use "wait times" as a functional metric to use in estimating relative demand from iPhone buyers. You only have to wait if there is a constrained supply. Of course, with three new iPhone X models (the enhanced XS, the larger and even more expensive XS Max, and the more affordable XR), it would be impossible to make direct comparisons against the previous year even if you had substantial real data on shipments or unit mix, because last year iPhone X was entirely new, and was selling largely in competition with a very different, much more conventional iPhone 8 and 8 Plus lineup. But analysts don't have any reliable access to Apple's actual unit shipments or product mix, and are forced rely on estimates that are largely just made up by other analysts or research firms who sell data they invent. As you recall, analysts last year were unable to ascertain (with all their channel checking, data modeling and guesswork-postulation) that iPhone X would be (and was) outselling Apple's entire lineup, including the far cheaper iPhone SE and iPhone 7 that hit those low price points that analysts have been insisting for years were key for Apple to bring its iPhones to a broader, high volume audience. Bary's current coverage of Zhang's "wait time" checks presented an alternative perspective of a peer analyst, but didn't seem to think of checking whether Zhang's "wait time" analysis for Rosenblatt Securities had previously unearthed any valuable insight into Apple's iPhone sales. It sure didn't last year. A quick search pulls up a report last October by Philip Elmer-DeWitt of Apple 3.0, who noted that Zhang (who PED described as an "Apple bear") had just delivered a note for Rosenblatt stating that preorders for iPhone X were strong, but that "we have ongoing concerns regarding sustainability of this pace. We believe preorder volume declined quickly after the first day, which could be attributed to long wait times." So Zhang's wait-time methodology previously predicted that iPhone X orders would fall off rapidly after its launch. They didn't. 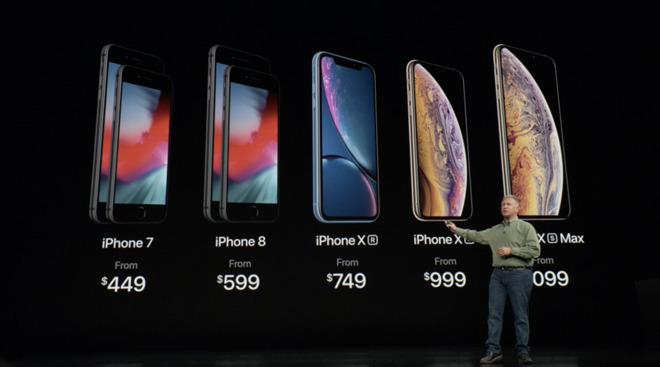 Further, Zhang attributed the strong preorders observed in China specifically to "smaller retailers that may have been using software to quickly preorder iPhone Xs with plans to resell into the end user market," again implying that strong preorders were not a reliable metric of demand, but that somehow the divination of "wait times" published by Apple were. In other words, don't believe what you're seeing, listen to the irrational nonsense that I'm making up. Apple's only hope in Asia, according to Zhang, would be future products down the road, including new iPads with Face ID, cheaper iPhones, a cheaper HomePod and a red iPhone. The only one of those to ship this year has been a Product(RED) iPhone 8.
iPhone X led Apple's sales and profitability, and it was Services, not new iPads or cheap devices, that lead to a surge in Apple's stock price this summer that Rosenblatt Securities entirely missed. A year ago, as Apple 3.0 noted in October, Zhang had a Neutral price target of $150. Meanwhile, Apple rocketed to an all time high and a trillion dollar market cap. Yesterday, Rosenblatt sheepishly upped its price target for Apple to $200, below the company's actual current closing price well above $217. Bizarrely, after the discounting of Apple was corrected this summer in response to investors finally seeing Services as Apple's path to strong growth (alongside new hardware categories including wearables), these analysts are again reverting to a myopic evaluation of iPhone shipments, and again going back to an old picture painted in the dark, with no thought given to how massive new sales of iPhones that last for many years are driving a critical mass of ongoing app sales, cloud services and subscriptions, along with peripheral sales of Apple Watch, AirPods and other connected devices. 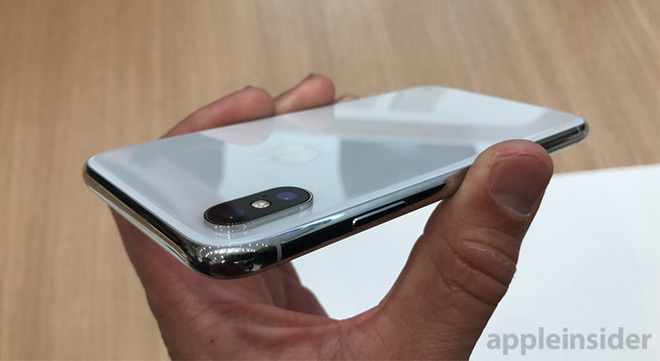 Doubling down on a false claim that "iPhones aren't selling in Asia"
A few months later in March, Zhang was again in the headlines for claiming that "new iPhones aren't selling in Asia," a story run by CNBC that offered no data supporting the idea that new iPhones weren't selling, apart from Zhang stating that iPhone X continued to disappoint and that it "did not sell well during the Chinese New Year" and that "we are not surprised with the quick cooldown [sic] of iPhone X sales," along with his cut of "5.5 million" units from his own internal estimate. Within two months, the author of that same "report" (Anita Balakrishnan) turned around quoted Apple's chief executive Tim Cook as noting that the new iPhone X "was the most popular smartphone in all of China last quarter," adding that "the company's performance in China is particularly impressive as overall smartphone sales were down in Q1." That CNBCreport pointed out that "the iPhone maker reported $13 billion in revenue from Greater China during its second fiscal quarter -- a 21 percent year-over-year spike," and that "China is one of Apple's most important and competitive markets." Outside of China, the report stated that, "Apple also reported strong revenue growth in Japan, posting a 22 percent year-over-year jump. Revenue out of the Americas grew 17 percent; revenue in Europe grew 9 percent; and revenue in the rest of Asia Pacific grew 4 percent," all without ever noting that just two months earlier, the same writer for the same publication was providing a megaphone for an analyst who claimed "new iPhones aren't selling in Asia." If you report something completely false, you should correct it. Zhang wasn't just wrong about iPhone X demand. He also told anyone who was listening last September that iPhone 8 preorders were "substantially lower" than prior iPhone 7 and iPhone 6 levels, apparently using the same data modeling used to claim that iPhone X was weak a month later, and that iPhone XS model were weak this year. And last summer, he actually insisted that iPhone 8 would not only ship later than expected due to Touch ID supply problems (based on the entirely wrong idea that Apple was trying to integrate Touch ID behind the display), but also claimed that full manufacturing wouldn't fully ramp up until the first calendar quarter of 2018. How wrong can you be before you lose all credibility? "Over the last several weeks, analysts and research firms have been evaluating how Apple Inc. has hit the rock bottom with the lukewarm response of its latest flagship iPhone X. Even though the world was intrigued by the design and technology of Apple's top-of-the-line handset, its sales remain sluggish. The mighty iPhone X failed to lure the masses because of its hefty price tag." He cited "checks from sources in the supply chain" by analyst Mehdi Hossein of Susquehanna Financial Group, which falsely laid out "a straight 73 percent drop in the sales of iPhone X as compared to the previous quarter," and claimed that "shoppers are preferring the older model of iPhones, and just aren't going for the latest and greatest," another dead-wrong prediction, presented by an analyst as fact and parroted by a blog as unverified truth. Despite being consistently wrong, presenting asinine analysis from laughable pseudoscientific analysis of "wait time" estimates or wholly illegitimate "channel checks" that have been proven wrong year after year, tech writers keep citing analysts like Zhang without noting their terrible track records-- or even the predictions they stood by just weeks before Apple announced earnings data that blew away their questionably sourced, historically inaccurate assertions.